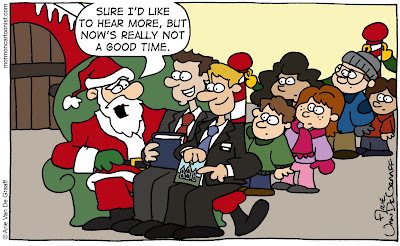 It's not the first time I've drawn a missionary sitting on Santa's lap for that magazine. Below is a gag they published years ago. 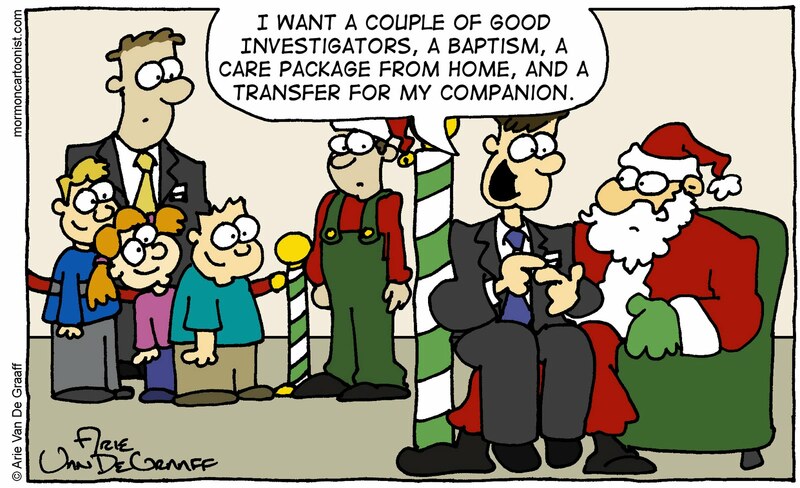 Ignoring the coloring job on the old joke, I think both of these gags work because there is something inherently funny about seeing a grown man sitting on Santa's knee. And I think this year's gag is funnier because if one grown man on a knee is funny, two grown men on a knee is a riot! Next year I'll test the law of diminishing returns when I submit a joke with an entire missionary district on Santa's knee. If Mrs. Clause was the RS President would she ever be released? Using Santa's equipment for determining who is naughty or nice she could easily find out who in the ward needs assistance or not. 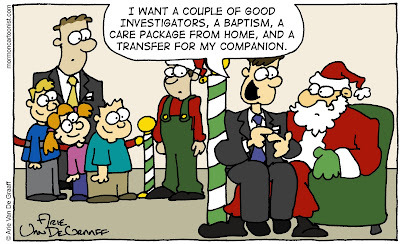 Can you imagine going to Santa for a Temple Recommend? Another very funny cartoon. That is sure one long femur on that Santa Claus. Jon, don't worry, there's another North Pole 1st Ward gag coming next month. And based on the number of excellent ideas you've submitted, chances are you'll get a co-creator credit. Anonymous, that is a big femur, isn't it. I suspect the second missionary is, in fact, sitting on Santa's knee. Ouch! 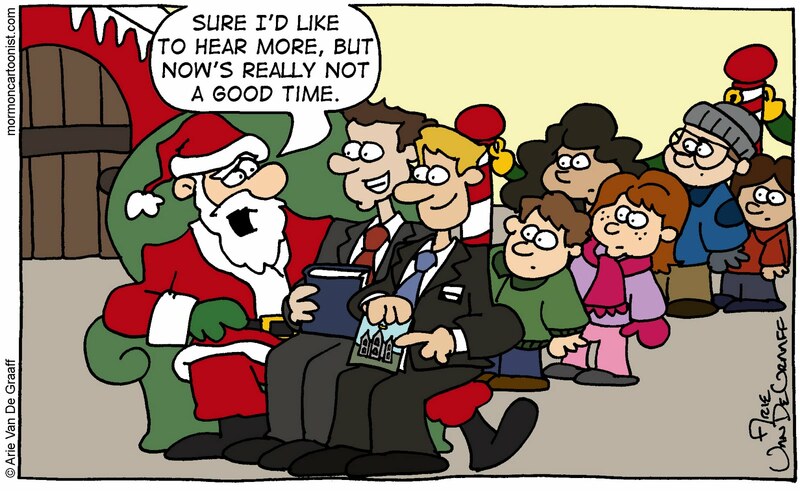 I think that the one with the misionaries is funny, because they are trying to ask Santa to be in the ward with their turn on Santa's lap. Thanks, Ava, I'm glad you liked it.